Unique anvil repair! - The Iron Forge Fire Blackmithing Forum. Just thought I would share this since I have never seen an anvil repaired like this. Its a barn find from someone I got talkin' to about blacksmith at a yard sale. looks like who ever owned it long ago needed to use it for some specific purpose. look at the step, there is a hold that goes down about 3/4 inch creating a little bowl/ pocket. along the edges there is a lot of mushrooming suggesting it was done as repetitive cold work with a lot of force. Enough it seemed to have broken the anvil at the waist. Yikes! but look how they repaired it.... no welds... and seems to work just as good. Also kind of an odd chip near the pritchel hole. Since this picture though it has taken a nice long bath in an electrolysis tank and now looks much better. Though any makers marks are long gone. I will try to get a new pic soon. That's a more common failure that you'd expect. 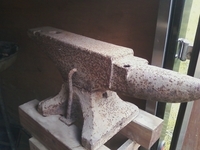 When those anvils were made they were in two pieces and forge welded at the wast. Sometimes it failed. Avoid any heavy work on it and it should do ok. I have seen broken horns and such, but never a repair bolting the anvil together. I am guessing they also drilled a peg between the 2 halves. I don't know that I will use it much. I got it because it was cool, great deal and thought maybe I would use this for more abusive work and save my other budden anvil from things like chisel work. I am pretty sure its an arm and hammer because it looks forged (horn is wonky shaped), and the tail has the tell step marks of the steam hammer that they used to use. I'd weld the sucker. Make it good as new. maybe one day that would be a good idea but as of now I don't have a welder with the power output, just a little arc welder meant for sheet metal basically. Due to the size of the waist and the shape of the horn, I'd suggest it to be a farriers anvil. They were never designed for Blacksmith shop type heavy work. In my lifetime all of the anvils, I have been around, with small waists are designed for light work. Those designed for heavy work have large waists, like me.